My sister Katy texted me last night to tell me that our Mom’s cat Maggie passed away sometime during the day. Mom had cats for just about my entire life. When I was born she and Dad had a cat named Dinah, whom I barely remember, although I dimly remember thinking she was someone to avoid. She died when I was still quite young. I grew up with an Abyssinian cat named Amos – I’m not sure if they got him before or after I was born – and he was around until 1987, along with our Welsh Corgi, Punkin, who joined us in 1976. I always found Amos somewhat aloof, even for a cat, just doing his own thing. I don’t really have strong memories of him, even though I was a teenager for part of his life. In 1988, after I went to college and Amos passed away, Mom and got a couple of cats, a sweet tabby named William, and a feisty polydactyl calico named Jenny. William was my buddy whenever I visited, and I was very sad when he passed away in 2000. Jenny lived a couple more years, and I think enjoyed being an only cat. We weren’t sure Mom would get another cat after Jenny – well, maybe Mom was less sure than the rest of us – but she found Maggie at a shelter, I think around 2003. The shelter said she’d been found pregnant and with a collar on her neck which was too small. And she was a small cat – maybe 7 pounds – a calico with smoky fur and a smudge on her nose. Mom adopted her, and really had to stick out caring for her for that first year, because she said Maggie took a long time to warm up to her, and even longer to really become her friend. But eventually she settled in with Mom, coming down for treats or to lie on the newspaper, and moving from room to room to lie in the sun in various windows. I guess she would growl and hiss loudly at cats who came into her yard, and avidly watched all the birds which flew into the yard. She was not a very friendly cat, usually running and hiding when visitors came. It would take several days after I’d arrive to visit before she’d do more than look at me around a corner. She didn’t bite or scratch (much), she just wasn’t very friendly. She did warm up to me when I stayed at Mom’s house while she was recovering from knee replacement surgery in 2012, even getting into the morning paper routine. She’d even sit at the top of the stairs and meow for me to come to bed when it was Mom’s usual bedtime! Maggie had a hard time in Mom’s apartment in assisted living, with people coming in and out several times a day, and having a pretty small place to live. Mom played with her a lot, but as Mom declined (and I see in hindsight that she hid a lot of the symptoms of her decline from us) I think she became neglected and lonely. The nursing staff told us that when Mom passed away she meowed loudly for a while afterwards, and then she had to endure several days in the apartment alone, with the occasional visitor to give her food and scoop her litter, until Katy and I came to clean out the place. Katy volunteered to adopt her, and something remarkable happened: She moved into Katy’s house, with her son and her two young cats, and she totally took over the house. She whipped the young cats into line, and became very friendly to the humans. Katy says when she’d have workmen over, the other cats with disappear but Maggie would stay and supervise them. And last December, when Katy adopted a young dog, Maggie told the dog who’s boss, and used him against the other cats, since they didn’t like him. So after everything, Maggie got her happy ending, a year and a half in a nice old house, with friendly humans, lots of wet cat food, and plenty of time lying in the sun on the porch. Katy said Maggie had been getting small and thin lately, and we’re not really sure how old she was. 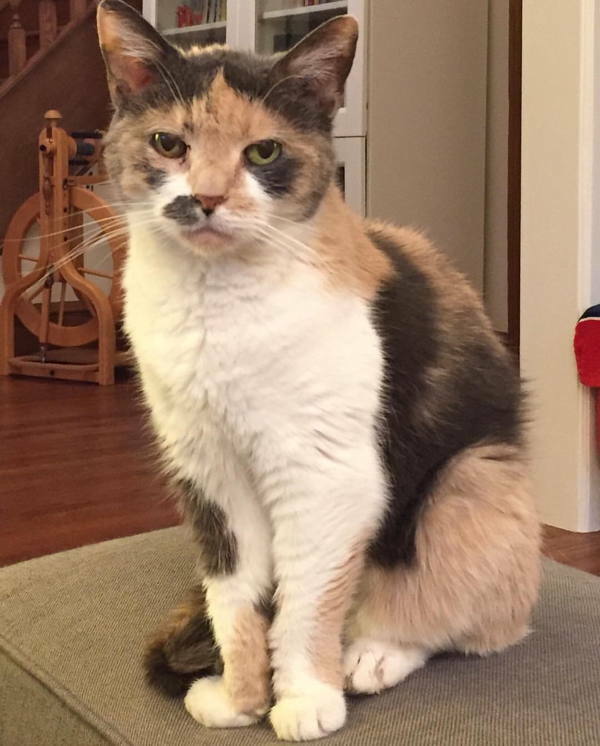 Our best guess is that she’s 13, about the same as our calico Roulette, but she could easily have been a year or two (or more!) older than that. She always had kind of cruddy teeth, which is not a recipe for long-term health. So it was not really a surprise, though the suddenness was a bit of a shock. I don’t think Maggie would have done well with a long decline, anyway. Katy says she’s having Maggie cremated and will spread her ashes over Mom’s grave next time she visits. I think they’d both like the thought of that.